Lisa Alzo of TheAccidental Genealogist is having the fourth annual "Fearless Females: 31 Blogging Prompts" for the month of March to Celebrate Women's History Month. There is a topic for each day of the month of March to commemorate the "Fearless Females" in our families. The topic for March 3 is, in part, "Do you share the first name with one of your female ancestors? Perhaps you were named for your great-grandmother, or your name follows a particular naming pattern." I was named after two Fearless Females in my family. I'm named Catherine after my mother's sister Catherine. My middle name is my mother's name Leona. My first and middle names come from two separate lines on my maternal side. I thought I'd see how far back I can trace these names. 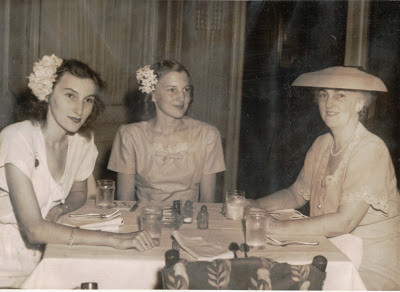 Pretty Ladies - My mother Leona, my aunt Catherine, and my grandmother Leona. Probably taken in 1945 when my mother graduated from Ward Belmont, a junior college in Nashville, Tennessee. Aunt Catherine was named for her and my mother's maternal grandmother (my great grandmother) Catherine Margaret Young. Catherine Young may have been named for her grandmother Catherine Barry MacIntyre. I'm not sure about the spelling. I've seen it spelled Catharine. Or it's possible that she was named for her mother's sister Catherine Caroline Wyche. Maybe she was named for both. There is a Catherine Lawson who is the great aunt of Catherine MacIntyre and sister of my sixth great grandfather Roger Lawson. She may be for whom Catherine MacIntyre was named. Here's where the trail ends for me in tracing my first name Catherine. My mother Leona was named after her mother (my grandmother) Martha Leona Roberts. My grandmother Leona was named for her aunt Martha Leona Roberts, her father John Taylor Robert's sister. The trail ends here. I don't have enough of these branches filled out on my tree to trace this name any further back. These names have continued for at least one more generation but in variations of the names. I named my daughter after my great aunt Kathleen Roberts, my grandmother Leona's sister. I was told that Kathleen was a derivative of their mother Catherine Young's name who was called Kate for short. My oldest brother named his daughter a shortened version of our mother's name (Lee) combined with her other grandmother's name. I had a professor in college who decided he was going to call me Kate. He said "Catherine" was too long. I don't like being called a nickname, but I told him I'd allow it since that's what my great grandmother was called. To this day, he still calls me Kate.